Happy holidays to all our family and friends! It has been another fabulous year at both Kitchen Sink and Meyer’s Olde Dutch. We are so appreciative and thankful for all our customers and your continued patronage. Our back of the house teams feel so lucky to be able to work with the best of what the Hudson Valley has to offer. We have amazing farmers, purveyors and suppliers who enable us to create dishes that are a fun fusion of local, international and family influenced cuisines. We thank you for all your votes of confidence in 2018. Chef Brian is so grateful that all of you selected him as Chef of the Year in the Best of the Hudson Valley Contest. So many of you came out to cheer on the friendly competition we had at Meyer’s Olde Dutch with our first ever Wing-Off! And a special highlight of the year was helping to raise over $2000 for our local Common Ground Farm. 2019 is certain to bring you many more tasty events at both Kitchen Sink and Meyer’s Olde Dutch. Please watch this space for upcoming announcements. At Kitchen Sink we often have menu updates. Please check our website for our latest menu updates. We often have food and cocktail specials at Meyer’s. The biggest news is our addition of on-line ordering at MOD. Just go to our website, Meyersoldedutch.com, click on the link and place your order. You can pay with a credit card on line or in cash when you pick up. If you haven’t finished your holiday shopping yet gift certificates to Kitchen Sink and Meyer’s Olde Dutch make fantastic gifts. No worry about what size to buy! Kitchen Sink will be open on New Year’s Eve. We will be serving our regular menu (not our regular Fried Chicken Monday dinner). Reservations are strongly suggested. You can make reservations on our website, kitchensinkny.com on the “visit us” tab or please go to our Yelp page and the link is there as well. Please visit our websites for our holiday hours. If you had the Hot Toddy created by our mixologist, Ed Gibbons Brown, last winter, you will definitely want to give the winter 2018 version a try. As a subscriber to our newsletter, like to share a little something special. Here is the recipe for this year’s Hot Toddy, which will be marvelous over the upcoming holidays! If you've been following us here at Kitchen Sink and Meyer's Olde Dutch, you know that we source every ingredient that we can locally and sustainably. In fact, much of our produce comes straight from our our own family farm, Truckload Farm & Orchard, here in the Hudson Valley and that includes our honey! We are especially proud of Truckload's magnificent beehives. August 18th is National Honey Bee Day (who knew?! ), which exists to raise awareness about the trouble honey bees are facing here in the U.S. and around the world. We wanted to take this opportunity to give our little beauties a shoutout, and make sure you were introduced to some of our hardest workers. 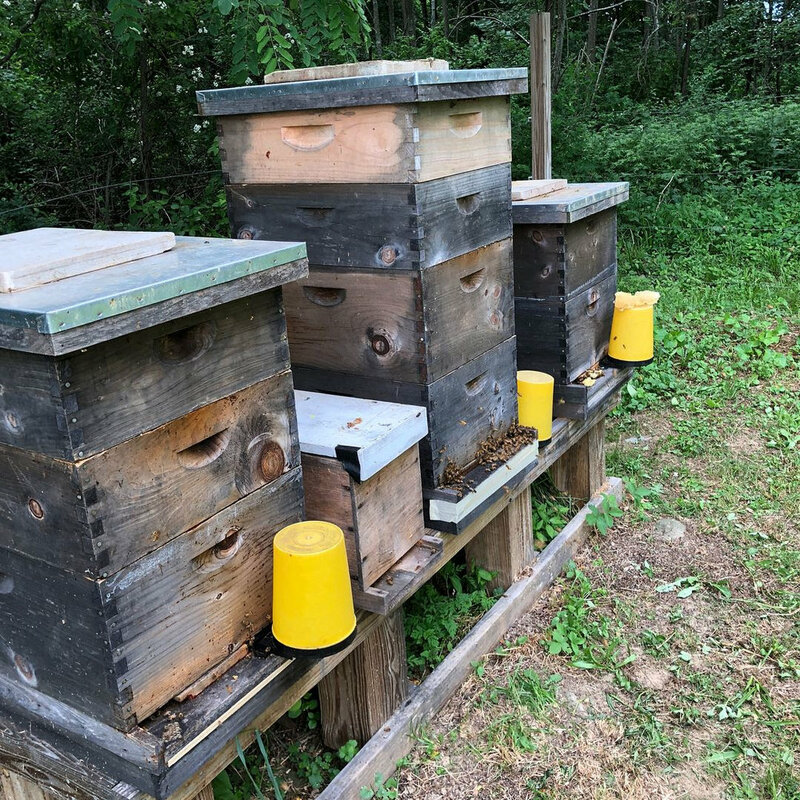 This summer, we went from three beehives to four, and right now they are buzzing about, pollinating our local wildflowers, vegetables and making the most delicious and sweet Hudson Valley honey you can imagine. Lucky for you, you don't have to imagine for long, because the honey they make is a key ingredient for our desserts, often mixed with marscapone or whipped cream as a topping, or as a soaking syrup for some of our favorite cakes! If dessert is not your thing, try the Local Greens Salad at Kitchen Sink. Truckload honey is an important component in our lemon vinaigrette! If you are looking for a perfect new summer cocktail, here is a little known secret: Meyer's Olde Dutch's Ed Gibbons Brown was recently honored for creating a brand new cocktail! "The Conquistadora" was recognized as a top 5 national finalist in the Tales of the Cocktail competition. It is not on the menu, it is available by request to MOD Insiders (which you are!). Read more about the inspiring history behind the cocktail here. Aside from National Honey Bee Day, August is also known as "The Dog Days of Summer." In honor of Bentley, Chef Brian's dog and best buddy, We want to remind you that well behaved, leashed dogs are welcome on the patio at MOD. We know its hot out there, but before you know it, we'll be in hibernation season, so join us and soak in all the Vitamin D and sunshine that you can! And bring your best buddy with you. Whether you are a hamburger connoisseur, a hot dog person or a vegetarian – there is one thing we can all agree on: Cornbread. If you want your next BBQ to be the talk to the town, check out Chef Brian's secret how-to video for making some seriously amazing cornbread. If you don’t believe us, stop by Kitchen Sink any Monday night for Fried Chicken Monday, where you can get a taste, without having to lift a measuring cup! Now, while you are enjoying your cornbread, we want to give a special thanks to Common Ground and our guests who attended the June 21st benefit. We raised over $2000 for their mission to create food access, food justice, and to educate people of all ages about healthy food and agriculture that is ecologically sound. The evening was fun, meaningful, and quite delicious! A Congratulations is also in order to Chef Adam Moses of Meyer's Olde Dutch for winning the first ever Beacon Wing-Off! A rematch is in order, so stay tuned here for our next food-challenge competition. Finally, this summer marks 3 years since Kitchen Sink opened and 1 year since Meyer’s Olde Dutch became part of the community! We can never thank our customers enough for making us part of your family. Hudson Valley Restaurant Week has become a wonderful tradition for our community, within and beyond Beacon. For customers, it’s been an exciting way to try new dishes and places. For chefs and restaurant staff, it’s been a great reason to try cooking and serving something different or an old favorite. Most importantly, each Restaurant Week has given us a vehicle to create new moments and memories around the table with the people we love. For this year’s March Restaurant Week, we wanted to go beyond the usual specials and create an experience for our customers that celebrates the connection between our collective traditions and the beauty of discovering something new. Food has a wonderful way of bringing back some of my fondest memories, and when I’m cooking (or eating) a dish passed down from a loved one that’s no longer with us, it brings them back to me – and to my family – for just a few moments. With that in mind, I am eager and excited to bring you “a trip down memory lane” with our restaurant week specials. Each item here has a story or memory attached to it. Some are family secrets – like Grandpa Meyer’s meatballs, which were originally made as the stuffing for stuffed cabbage – and others, like the latkes, have been handed down, and tweaked or added to by each generation. We share these dishes in order to welcome you further into our family, and with the hope of helping you to create a special – and delicious – memory of your own during this very special restaurant week. L’Chaim! Cheers! & Bon Appetit! Well, Friends, it has been a busy few months! 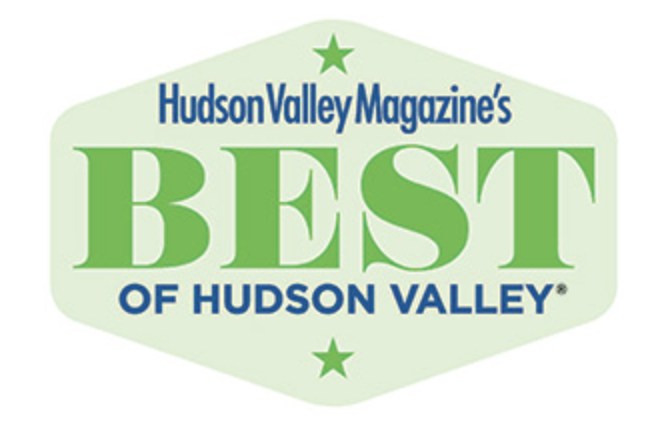 First, we want to thank everyone who voted in this year’s Best Of Hudson Valley contest. We are so humbled and pleased to tell you that readers named Kitchen Sink the Best of Hudson Valley for Comfort Food! Maybe it’s the Fried Chicken Mondays – or maybe it’s because of our menu is full of feel-good, family influenced cooking – but either way, it is an honor to be considered a source of comfort to the friends, family and neighbors that we serve daily. We hope you’ll continue to think of us that way – no matter what your craving. Thanks largely to the out pouring of love and support we’ve received since opening Kitchen Sink two years ago – we took a big leap this year and expanded our operations to a NEW restaurant just down the street in Beacon. Our team proudly opened Meyer’s Olde Dutch Food & Such this past July, and it’s been a wild ride so far! If you love Kitchen Sink’s cozy atmosphere and farm-to-table goodness – give Meyer’s a try when your craving top-notch finger food. In keeping with our food-losophy, Meyer’s is cranking out locally sourced burgers and sandwiches (beef, pork, chicken and vegan options of course! ), hand cut fries, house slaw and signature sauces. Meyer’s is also gaining quite a reputation for our house-crafted cocktails. Stop in and order one of our vintage-inspired drinks or tap into one of our new creations – and see what the buzz is all about. Learn more about Meyer’s Old Dutch and check out the menu here! Here in Beacon, we know that the local fall foliage always draws in tourists and visitors– but this year it seems as though the smell of fresh Hudson Valley cooking has also caught their attention! The delicious aromas comingfrom Kitchen Sink and Meyer’s Olde Dutch reached the newsroom of the New York Times. If you haven’t had a chance, check out this article outlining a day trip to Bannerman Castle and stops in Beacon to enjoy our “killer crispy chicken sandwich,” and “seasonal, delicious dishes.” Sounds like a fun trip, if we don’t say so ourselves! Finally, if all of the above isn’t enough reason for you to come visit us – here is a bonus: Beginning on October 30th through November 12th, Kitchen Sink will be participating in Hudson Valley Restaurant Week! During that time* Kitchen Sink will be offering a special three course dinner menu for $32.95. For anyone that joins us during #HVRW, we will also be giving out cocktail coupons for Meyer’s Olde Dutch – so trust us when we say, you don’t want to miss this! We usually fill up fast- so make your reservations now! *Please note – Our HVRW menu will run during dinner on Wednesday through Sunday only. Monday night will continue to be Fried Chicken Monday at the regular price and we are closed Tuesdays. We are closed for lunch. Chef Brian Interviewed on "Food Friday"
What better way to show your love on Valentine’s Day than sharing feel-good food in Kitchen Sink Food & Drink’s cozy dining room? Kitchen Sink will open its doors on Tuesday, February 14 – reservations are strongly encouraged and can be made online at www.kitchensinkny.com on the “visit us” page. It's time to get out the vote again! Our fans did an AWESOME job in 2016 getting Kitchen Sink Food & Drink the title of Best New Restaurant in the Hudson Valley. No pressure, but if you plan to vote in Hudson Valley Magazine’s 2017 Best of Hudson Valley Awards, please consider voting Kitchen Sink for Best Brunch, Best Chef (Brian Arnoff), Best Grilled Cheese, Best Fried Chicken, Best Cookie, Best Restaurant in Dutchess County (and of course any other category)! $29 Sunday Suppers End Soon! Now through March 5, Kitchen Sink guests can choose from the regular menu or a special Sunday Supper menu, which includes a salad, choice of pasta and dessert, for $29. A gluten free/vegan cauliflower risotto is always one of the options. Recently spied on the menu: butternut squash lasagna with house made lasagna noodles, a blend of ricotta, fontina and Grana Padano cheeses mixed with caramelized onions and pecans over a dollop of parsley and pecan pesto. Reservations are strongly encouraged and can be made online at www.kitchensinkny.com on the “visit us” page. Parties of 6 or more should contact the restaurant directly at 845-765-0240. Kitchen Sink will join fine dining restaurants across the Hudson Valley March 6-19 for Hudson Valley Restaurant Week. Kitchen Sink will offer a special 3-course menu for $29.95 in addition to the regular dinner menu. Reservations are strongly encouraged and can be made online at https://www.yelpreservations.com/r/kitchen-sink-food-drink/. Parties of 6 or more should contact the restaurant directly at 845-765-0240. Residents of Beacon who show proof of address receive 10 percent off their bills on Thursday evenings through the winter season. This is chef Brian’s way of saying thank you to his neighbors. Kitchen Sink’s warm and intimate space is the ideal location for holiday parties with co-workers, friends and family. Restaurant buy-outs and intimate celebrations are welcome! Celebrate with Kitchen Sink’s eclectic mix of global and family-influenced cuisine and small production wine, beer and cider from Hudson Valley producers. Chef Brian works with each group to create a dinner or Sunday brunch menu that works for their occasion and budget. Call or email Brian at 845-765-0240 or brian@kitchensinkny.com to plan your event. Chef Brian’s famous Monday Night Fried Chicken Dinner is offered standard, or buffalo-dipped with house-made blue cheese dipping sauce with all the fixings. It includes three pieces of 24-hour buttermilk brined free-range chicken, mac & cheese, coleslaw, a pickle, cornbread and a salted caramel chocolate chip cookie, all house-made from scratch. A fried cauliflower option is also available. Orders can be called-in on Mondays and picked up starting at 5pm. To order, call 845-765-0240. As always, eat-in is also available every Monday night. Monday: Open for Fried Chicken Dinner starting at 5pm. Sunday Supper: Through March 5, 2017 - get a salad, choice of pasta and dessert for $29 per person! Starts at 5pm. Kitchen Sink Food & Drink is located at 157 Main Street in Beacon, NY and can be reached at 845-765-0240 or brian@kitchensinkny.com. Reservations are strongly encouraged and can be made online at www.kitchensinkny.com on the “visit us” page. Parties of 6 or more should contact the restaurant directly at 845-765-0240. Wishing all of our family and friends a very healthy and happy New Year! Please Note: We will be closed for brunch on Sunday, January 8 but will be open for Sunday Supper at 5pm. For Super Bowl LI - February 5, 2017 - we will be offering a selection of great for game watching takes out items! You must order in advance no later than Wednesday, February 1 for pick up on Sunday. On Sunday evenings through the winter season, Kitchen Sink guests can choose from the regular menu or a special Sunday Supper menu, which includes a salad, choice of pasta and dessert, for $29. A gluten free/vegan cauliflower risotto is always one of the options. Recently spied on the menu: butternut squash lasagna with house made lasagna noodles, a blend of ricotta, fontina and Grana Padano cheeses mixed with caramelized onions and pecans over a dollop of parsley and pecan pesto. Heaven on a plate! (See attached picture.) Reservations are strongly encouraged and can be made online at www.kitchensinkny.com on the “visit us” page. Parties of 6 or more should contact the restaurant directly at 845-765-0240. Customers who purchase gift certificates at Kitchen Sink get an additional $10 for every $100 they spend. They can choose to add it to the gift certificate or get a gift certificate for themselves for their next meal. Kitchen Sink’s warm and intimate space is the ideal location for holiday parties with coworkers, friends and family. Restaurant buy-outs and intimate celebrations are welcome! Celebrate with Kitchen Sink’s eclectic mix of global and family-influenced cuisine and small production wine, beer and cider from Hudson Valley producers. Chef Brian works with each group to create a dinner or Sunday brunch menu that works for their occasion and budget. Call or email Brian at 845-765-0240 or brian@kitchensinkny.com to plan your event. Chef Brian’s famous Monday Night Fried Chicken meals go perfectly with Monday Night Football. The fried chicken dinner is offered standard, or buffalo-dipped with house-made blue cheese dipping sauce with all the fixings. It includes three pieces of 24-hour buttermilk brined free-range chicken, mac & cheese, coleslaw, a pickle, cornbread and a salted caramel chocolate chip cookie, all house-made from scratch. A new fried cauliflower option is also available. Orders can be called-in on Mondays and picked up starting at 5pm. To order, call 845-765-0240. As always, eat-in is also available every Monday night. New Year's Eve: Regular menu served—reservations are highly encouraged. Kitchen Sink joins fine dining restaurants across the Hudson Valley for 2016 Hudson Valley Restaurant Week. Kitchen Sink will offer a special 3-course Restaurant Week Menu for $29.95, in addition to the regular dinner menu. The 2016 Restaurant Week menu includes Chef Brian’s eclectic mix of global and family-influenced dishes, featuring seasonal produce and menu favorites like Grandma’s Brisket Grilled Cheese. Reservations are strongly encouraged and can be made online at https://www.yelpreservations.com/r/kitchen-sink-food-drink/. Parties of 6 or more should contact the restaurant directly at 845-765-0240. Kitchen Sink’s warm and intimate space is the ideal location for holiday parties with coworkers, friends and family. Celebrate with Kitchen Sink’s eclectic mix of global and family-influenced cuisine and small production wine, beer and cider from Hudson Valley producers. Chef Brian works with each group to create a dinner or Sunday brunch menu that works for their occasion and budget. Call or email Brian at 845-765-0240 or brian@kitchensinkny.com to plan your event. v Delicata Squash, featured in a Delicata Squash Salad, with whipped ricotta, roasted garlic sage puree, cornbread crouton, maple chardonnay vinaigrette. v Beets, featured in a Beet Soup, with apple, dill and sour cream. v Spaghetti Squash, featured in a Spaghetti Squash Gratin entree, with Fazio Farms burrata, spicy tomato sauce and arugula. v Cauliflower, featured in Vegan Cauliflower Faux Risotto. v Carrots and Brussels Sprouts, featured in a Chicken Tzimmes entree with honey ginger glaze, carrot puree, kasha and Brussels sprouts. v Sweet Potatoes, featured in Red Chili Glazed Lamb Meatballs with ancho and sesame mole, black beans, glazed sweet potatoes, green tomato raita. Dinner al Fresco in November? New outdoor heaters grace Kitchen Sink’s back patio, and we will keep them running through November, while the weather permits. New Year's Day: Sunday brunch menu served 11am - 4 pm. Chef Brian’s famous Monday Night Fried Chicken meals go perfectly with Monday Night Football. The fried chicken dinner is offered standard or buffalo-dipped with house-made blue cheese dipping sauce, with all the fixings. Itincludes three pieces of 24-hour buttermilk brined free-range chicken, mac & cheese, coleslaw, a pickle, cornbread and a salted caramel chocolate chip cookie, all house-made from scratch. A new fried cauliflower option is also available. Orders can be called-in on Mondays and picked up starting at 5pm. To order, call 845-765-0240. As always, eat-in is also available every Monday night. Chef Brian and Kitchen Sink Food & Drink will be offering food samples at theBest of the Hudson Valley Party on Thursday, October 13, 2016 at the Grand Hotel in Poughkeepsie. Kitchen Sink is providing soup for the Poughkeepsie Farm Project’s Soup-A-Bowl, an annual benefit event that raises funds for the Farm Project’s vital programs, which support local soup kitchens and pantries, shelters, and access to farm fresh food for low-income community members. The event will take place at the Vassar Alumni House—tickets can be purchased at http://www.farmproject.org/soup-a-bowl-2016. Kitchen Sink joins fine dining restaurants across the Hudson Valley for 2016 Restaurant Week. In addition to the regular menu, a special 3-course menu will be available for $29.95. Reservations are accepted one month out, online at https://www.yelpreservations.com/r/kitchen-sink-food-drink/. Kitchen Sink has started booking holiday parties, and is also available for showers, girls night out, parents night out, book club meetings, and other group gatherings. Chef Brian can create a menu that works for your group and budget. Those interested in holding an holiday party or event at Kitchen Sink can call or email Brian at 845-765-0240 or brian@kitchensinkny.com. And, did you know that eating local has all kinds of health benefits? In fact, eating local is just as much about personal nutrition as it is about local economic benefits. When something is grown locally and cared for by a person or family that relies on the quality of the product, you know that they didn’t take shortcuts. That just one of the reasons why we believe that it’s important to support Hudson Valley farmers and food purveyors. Cooking and serving meals made from healthy, nutritious and flavorful ingredients is a top priority for Kitchen Sink – and luckily for us, the Hudson Valley has an abundance of fresh produce that hits the mark! 1. Order Local, Eat Local, LOVE local: Try to eat at restaurants that use local ingredients. It’s not always about low calorie, but what is actually healthier. Local ingredients tend to be more nutritious as they were more recently picked and have not lost vital nutrients while they were being shipped across the country. They also haven’t been factory processed and are more wholesome. 2. Sharing is caring: Often times restaurants serve portions too big to finish. Instead of ordering your own, think about ordering a soup or salad and then sharing a main. Or another solution is to order appetizers as mains, since these are usually a bit smaller in size. 3. Know your Rolls: Lets be real, everybody digs into the breadbasket put out before the meal – even if the bread isn’t that great. We have a rule that we only eat bread at a restaurant where the bread is made locally or in house. It has to be special to be worth eating. 4. Feast on Fish: If you can find a restaurant that serves wild caught local fish, you are in luck. Wild caught seafood is more eco-friendly, it’s better for your body because it won’t have hormones pumped into it. Plus, ounce for ounce, fish is a less caloric form of protein. 5. Don’t Whine, WINE. Aside from all the well-known health benefits of red wine, here in New York we have the opportunity to drink wine that is made nearby! Try to drink wine over mixed drinks, as that usually saves calories and is better for maintaining a low sugar intake. In addition to these tips, you should keep trying new things and have an open mind to new types of cuisines! You never know what healthy item might just excite your taste buds! Wishing you a happy and healthy National Nutrition Month! And we hope to see you for dinner soon! The Kitchen Sink staff and I are so happy to be back in the kitchen after our short hiatus! We truly missed serving you the very best of Hudson Valley flavor – but while we were away, we were able to accomplish some serious “food research” (aka eating)! During our break, I visited Thailand with my wife Jaimee. We visited Bangkok and Chaing Mai and ate at some of the most amazing restaurants. From one-dish street vendors to world class restaurants, every bite was more flavorful than the last. Thais love to showcase ingredients unique to the region like water spinach, Wing beans and Thai river prawns. We sampled items typically associated with Thai food in the U.S., like Som Tom Thai or green papaya salad or Phat Thai (better known here as Pad Thai). These classics, although similar to their American counterparts, showcased the beauty that is simple food prepared with fresh, seasonal ingredients. In addition to the classics, we tried several regional specialties that are hard to find in the States, such as Sai Ua Samun Phrai, a Thai-style pork sausage and Khao Soi, a northern Thai curry and noodle dish. As we work on menu changes over the coming month all this and more will be weighing heavily on my palate and I look forward to bringing some of the delicious flavors that make up Thai cuisine right here to Beacon. Now that we’re back, there is so much to look forward to in February! Most importantly, we are doing a community event on February 10th to benefit the Poughkeepsie Day School! 10% of all the night’s proceeds will go to the school and the families it serves. As my alma mater, we couldn’t be more excited to see what familiar faces come out to support this great cause while filling the bellies of our neighbors! February also brings with it Super Bowl and Valentine’s Day – and we just want to remind you that Kitchen Sink accepts takeout orders AND reservations! Stay tuned for other news and promos by liking us at www.facebook.com/KitchenSinkBeacon. That’s all for now. Come visit soon! Hello Friends, Family and Foodies! We hope your holiday season is going splendidly – because here at Kitchen Sink, we are feeling festive as ever! · Now, speaking of reservations we have heard your cries – and we have answered! You can now make reservations to eat at Kitchen Sink online! 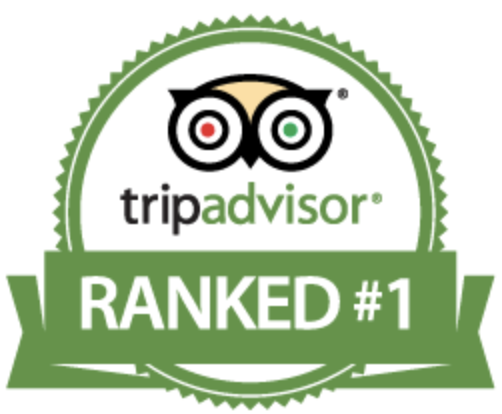 Simply click the VISIT US tab above or visit our Yelp Page and make a reservation on the right side of the page. · For those of you still looking for gifts and stocking-stuffers, you should know that our Kitchen Sink swag and gift cards make awesome presents for anyone who loves a good meal or a good steal (and that pretty much covers everyone). Seriously, a sweatshirt for your daughter, a hat for your son, and kids – do everyone a favor and get your parents a gift card. We bet they could use a night out! · If anyone is looking to throw a late holiday party, or perhaps an event to welcome 2016, you should know that Kitchen Sink is available for private parties! We’ve done a few this year and they have been a tremendous success! Keep your eye on our Facebook page for photos next week and call the restaurant for details! · Finally, a word on our holiday schedule. We will be closed on Christmas Eve and Christmas Day, but our doors will reopen on Saturday the 26th at 5pm for your post-Christmas dinner. Come on in to detox from the holidays with some farm-to-table, home-cooked goodness as you prepared to take on a whole new year. As for New Years Day, we’ll be open for dinner at 5pm to help you usher in 2016 right on time. As Hudson Valley Restaurant Week came to an end this week, we want to take a moment to thank all of the people and organizations that made it possible. We are truly honored to be a part of this community that not only values good food, but also good friends and good business. For all that took part, thank you for sharing our table, and we do hope you visit Kitchen Sink and the town of Beacon again real soon. This Wednesday we are enthusiastically jumping on the #Movember train! As a small tight-knit community we all know someone whose life has been affected by cancer. We’ve already partnered with Miles of Hope, and this week we are proud to support the #Movember movement! Movember raises awareness and funding for Men’s health issues, specifically Prostate and Testicular Cancer, by encouraging people to grow mustaches! This Wednesday, for every customer that comes in with a mustache for dinner, we will make a donation to the Movember Foundation. So, come in for a nosh and bring your favorite mustached friend – and you can do a little good in the process! That’s all for this week, but be sure to follow us on Facebook and Twitter to get daily updates on What’s New at Kitchen Sink! There is so much going on at Kitchen Sink this month… where do we start?! First and foremost, Kitchen Sink is proud to celebrate this Veteran’s Day by offering a free drink to all of our brave service members and veterans. We can never thank you enough for your service, but we can at least share a toast to this beautiful country and the incredible men and women who have fought for it. We hope to see you all for dinner! Secondly, as of Saturday, November 14th, Kitchen Sink will be celebrating 100 days of serving fabulous customers fabulous food! Thanks to everyone who has supported us so far, especially our local farmers, cideries and food purveyors who have helped to make our “farm-to-table” and “buy local” philosophies a reality. If you’ve been part of our first 100 days, stop in and give Chef Brian and high five. If you are still not convinced, then the only solution is for you to come try it for yourself. There are still four days left in Hudson Valley Restaurant Week, and our prix-fixe will give you the perfect opportunity to sample our menu! We can’t wait to welcome you to our Kitchen Sink. There is no better time of year in the Hudson Valley than autumn. The crisp air, the beautiful foliage, and most importantly the rich and delicious flavors that come from the fall harvest! There is just something special about this time of year, and we were inspired to start a “What’s New” page here on our website, as another way to invite you into Kitchen Sink. As we closed our Breast Cancer Awareness month we hosted a special fundraiser for our friends at Miles of Hope. We had a wonderful group of friends and live music join us for dinner, as we raised $2200 for an incredible cause. Special thanks to all who attended and made it such a lovely evening. We are participating in our first Hudson Valley Restaurant Week, and starting November 4th, we will have a 3-course, prix-fixe menu available to all of our guests. The Poughkeepsie Journal already highlighted us as a place to try – especially because of our commitment to local Hudson Valley food purveyors. Whether you are a regular customer or a first timer, don’t miss a chance to stop in for our #HVRW specials between now and Nov 15th. If you aren’t already following us on social media, what are you waiting for? Starting today, we will be giving away a free dessert to one lucky, social-media savvy food photographer! To enter, snap a pic of your favorite #HVRW dish at Kitchen Sink and upload it to Twitter, Facebook or Instagram using #KitchenSinkFavorite. We’ll announce our favorite photo and winner on November 16th.